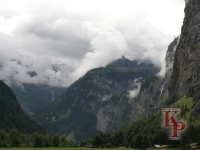 What does Lauterbrunnen have to do with Yosemite? They are completely different places, except they are both glacial valleys with spectacular scenery and waterfalls, and a similar size area. Looking at the equivalent (same scale) maps of Yosemite valley (Almost Tunnel View to Half Dome) and the Lauterbrunnen Valley (about Zweilütschinen to Stechelberg) helps make the comparisons. This area in Switzerland has a number of separate villages, multiple train lines, several cable cars (100 passenger capacity) and many ski lifts, and a few places to buy gasoline. Yosemite has a village (store, worker housing, etc. ), no gas station, the one loop road and trails (the Badger Pass ski area is outside the comparison area). 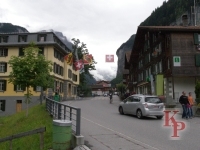 On a summer day, Lauterbrunnen has a lot more people (more hotel rooms, more day trippers and tour buses) and it seems like fewer cars (at least fewer people driving to the different sights -- they park once and stay put). The surrounding Swiss mountains are higher with permanent glaciers (especially the Jungfrau) but the first cliffs with the water falls are lower. Staubbach Falls, the highetst, is about 900 feet (sources vary, in fact single sources give multiple numbers), Yosemite Falls is 2425. 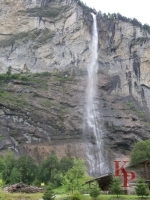 Staubbach Falls, the focal point of the village of Lauterbrunnen. Yosemite Falls (Upper and Lower), the focal point of Yosemite Village. The upper valley -- with a view toward the Jungfrau (or at least an adjacent mountain). Upper Yosemite Valley. The peaks are not as high in the background. The upper valley -- with a view toward the Jungfrau (or at least an adjacent mountain). 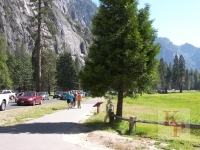 Lower Yosemite Valley, Cathedral Rocks.. Traffic through the village exists, but not like a big weekend in Yosemite. (This was taken on a big holiday weekend in Switzerland.) Weekend traffic when the waterfalls are at a peak. But there are no buildings, no hotels, no restaurants. The glacial valley rim offers views into the valley. 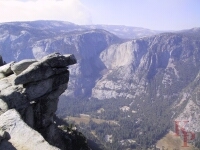 The valley rim, Glacier Point, offers views into the valley. 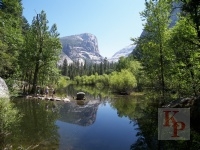 Yosemite Valley is deeper from the floor to the first rim. 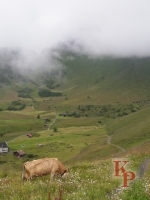 Swiss trails have secenery, but also cows. 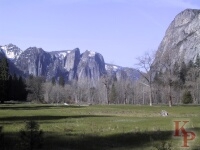 Upper meadows in Yosemite have scenery, but no cows. Deer are less likely to pose in the upper meadows than in the valley. 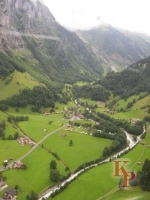 Some of these locations and others are included in stereo views of the Lauterbrunnen Valley in my collection of Stereo Views. Return to Yosemite home page.